Tonight is a quiet night. One where I opened up the window to hear the cars driving and the dogs barking. The last few days have felt rough. A bit of the old Emily creeping in. A good reminder that I'm still in process. Made new, but not yet made perfect. I'm still happier than I've ever been in my life. I get to plan a wedding to the most wonderful man. I have two jobs that I love. My life feels better than anything I could have ever even had the faith to dream. But there are still days when I have hard times. I forget that I've went through so much healing. That I'm different. But it's still easy to panic because when I feel the slightest thing, it makes me doubt that I'm any better. I worry that I'm not really as well off as people think. That I'm just fooling everyone. But I know the good times are real. And the bad times aren't near as bad as before. But still when glimpses of darkness come, it still feels like I'm my old self. Which then makes me want to cope in the old ways. But I can't even go back to that life now. Which then feels desperate because I don't have control. Which is good but hard. And I feel crazy. It's like healthy Emily feels things now. Like hurt and sadness and all that. Then old Emily tries to kick in and protect. But it doesn't work. So then I'm just stuck. And I want to fix it. But I can't. And it feels weird. And emotions can still be wrong, because I'm learning how to do this. It just is so messy. And I feel crazy. Sometimes. And I have weeks where I pretty well break something every day. After I wrote about that to you all in my last post. Seriously. Like every single day. My laptop is completely dead. (I'm typing this post painfully on the tablet my fiancé let me borrow, until my new laptop comes in. Also please excuse me while I take a moment to squeal about writing "fiancé" eeeeeee!!!!) And also my coffee pot, screen door to my house, door to my car, my purse, my internet... the list goes on. As I sit in my chair tonight a moment from my day keeps coming back to me. This afternoon I was sitting in my office. The beginning of this year I had rearranged my side of the office to have my desk facing the wall and my back to the door. I share an office with another person and we usually have a lot of people in and out. So I don't always even turn around when someone walks in. A woman who I don't know super well came in. She was dropping off her stuff then getting ready to leave. I meant to tell her goodbye but got caught up in my email I was typing. A moment later I felt her face up close to mine. She was bent over hugging me. The genuineness of the moment almost took my breath away. She said she just felt I needed a hug. She said I just didn't look myself today. I felt the love and concern in her face. No one else had seemed to notice. But she stopped to be with me. To offer me a bit of affection and presence. She probably doesn't even have any idea what that two minutes did for my spirit. That her closeness was just what I needed. And now I hear a train on the tracks outside my house. The sound is soft but distinct. 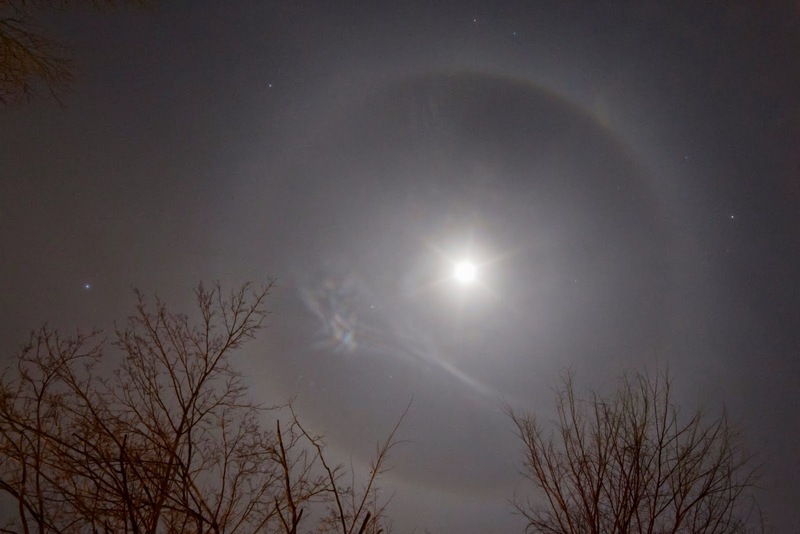 Several nights ago, Greg text me that there was a ring around the moon. I was already in bed and was in a mood. I wasn't willing to get up and look. When I woke up in the morning I had a picture message waiting for me. "In case you missed it." Tonight I feel contentment. Tonight I can sit still. I remember getting an unexpected message a few nights ago. Words of encouragement from another woman. Kind, kind words that I needed to hear. After a long day I still felt down and not in the mood to receive it. But still I recognized that Jesus was still good to bring that encouragement in the perfect time. Even if I was being a brat. And even if I still felt like I was the worst. I kind of feel like I'm rambling a bit tonight. And I'm pecking away at a teeny tablet screen with one finger. So at this point it is what it is. I guess I'm just feeling thankfulness for the people who help draw me back to reality. For taking time to send me a message full of kind words. For sending me a picture of things missed. For pulling me in close for a hug. For the ones I know so well and those not as much. And sometimes I receive things well. Sometimes I don't at all. But I'm learning to just be where I am. That something much bigger than how I feel in the moment is happening. That some days are just about persevering. And even those days have something to offer. And if I get it, then great. And if not, I have wonderful people around me to help bring me back to moments lost. Acts of redemption. Acts of love and kindness. Let us not underestimate those.